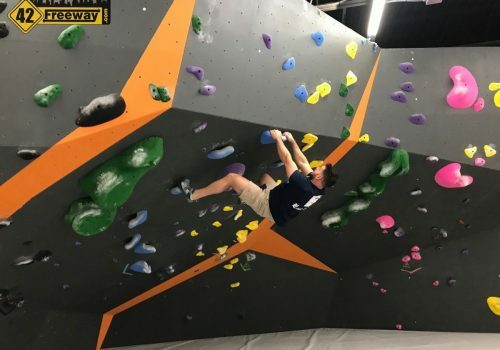 In very simple terms… it’s climbing. 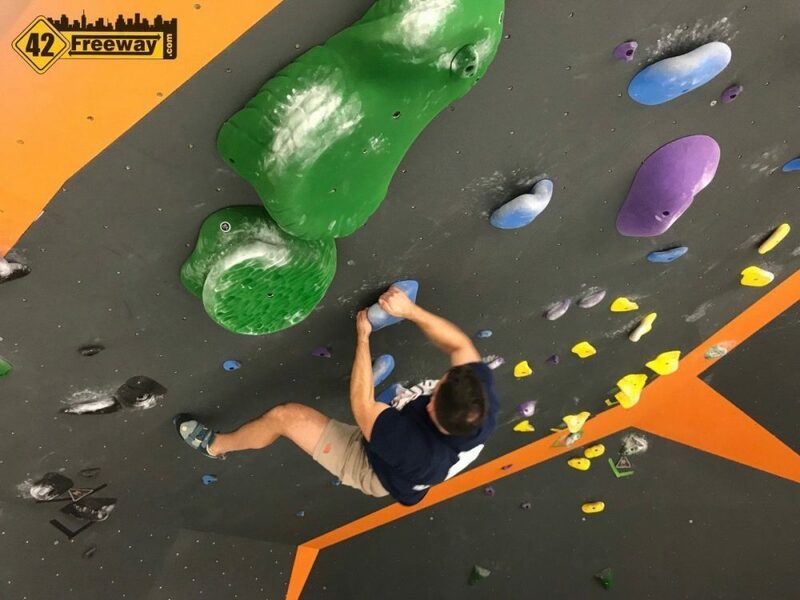 Rock climbing. 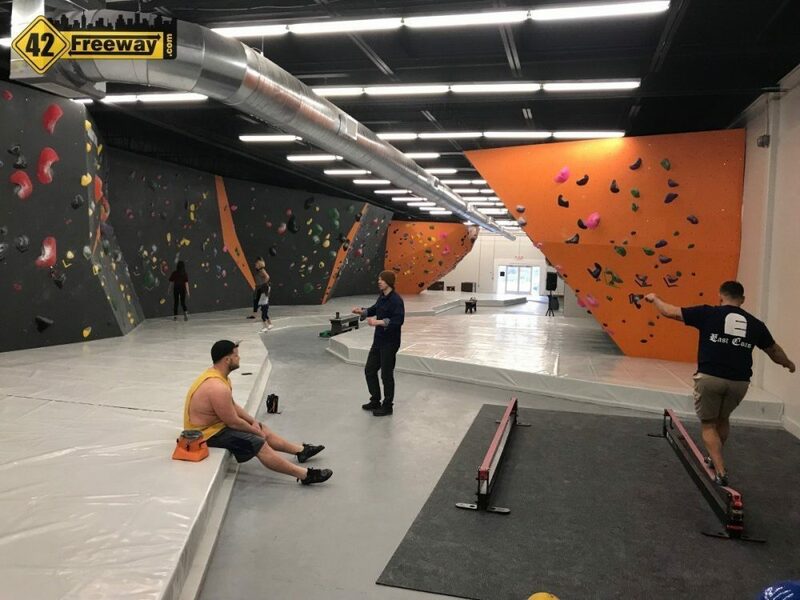 Indoors. 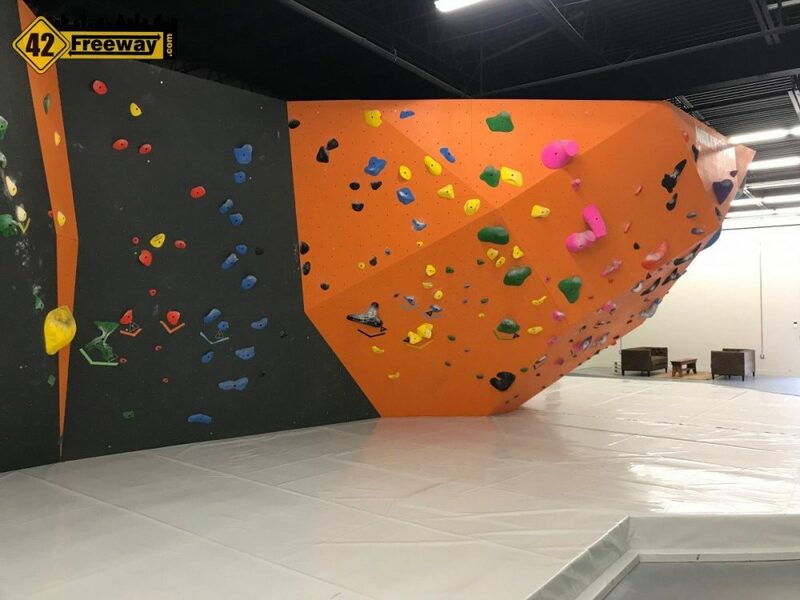 At it’s highest, the top is 16 feet, and there are no safety ropes. 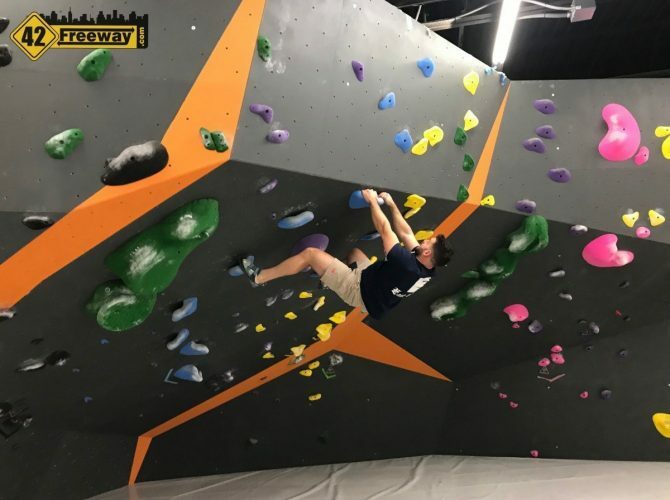 Now that may seem intimidating but keep in mind that your feet are much lower than the roof (if you have to jump down) and most of the layout is much lower. 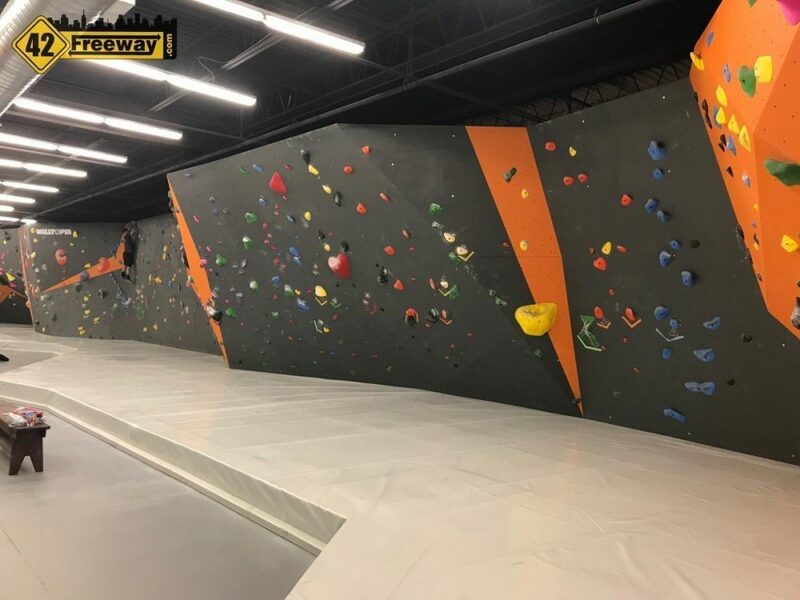 In fact there is an almost endless array of courses laid out across the large facility to challenge people of all skill levels. 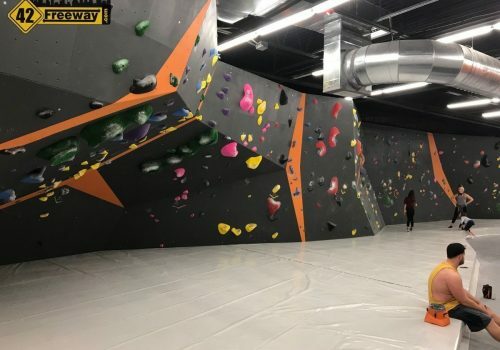 While kid’s are welcome.. this is not really a kid’s gym like Launch Trampoline. 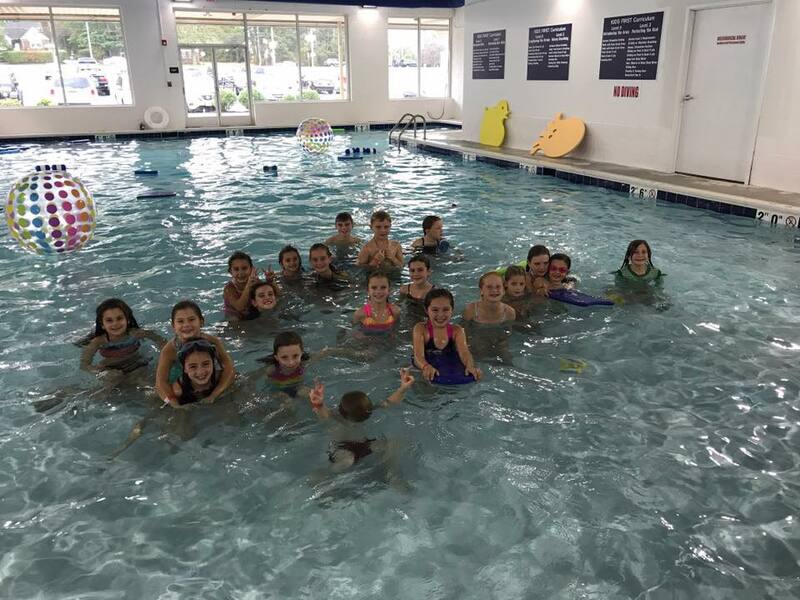 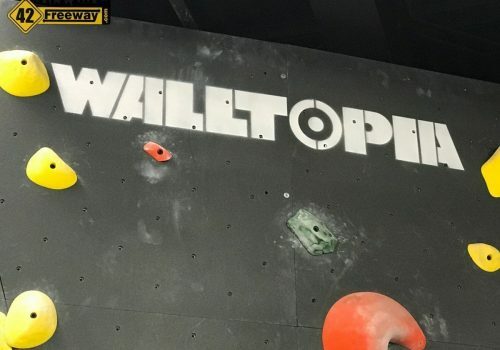 This is mainly meant to be an all ages experience, with adults being a core target audience. 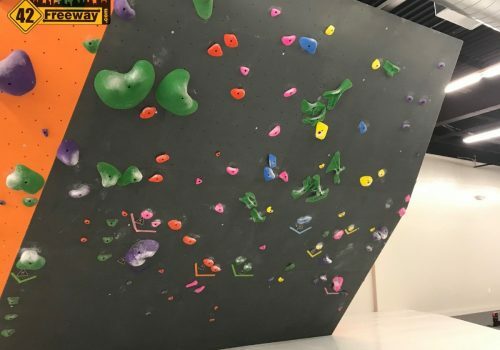 When I visited a mom was there with her two chikdren (about 7 and 9) and all three were climbing together, under mom’s watchful eye. 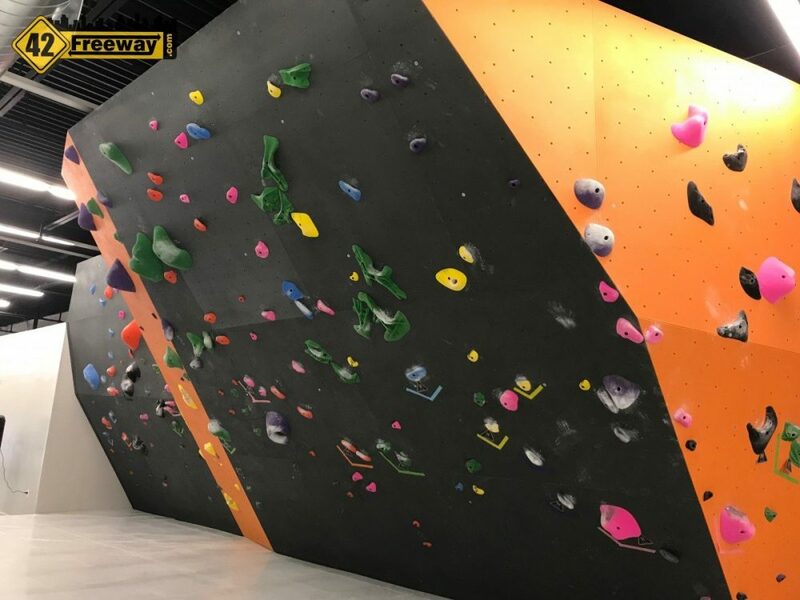 There are several pricing options from full memberships to daily passes. 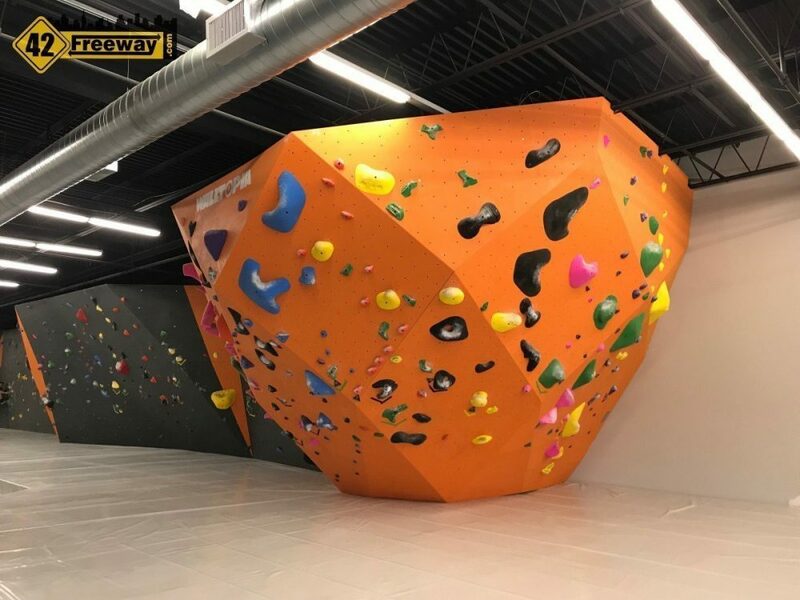 Equipment requirements appear to be very light, but they do offer special bouldering shoes to rent. 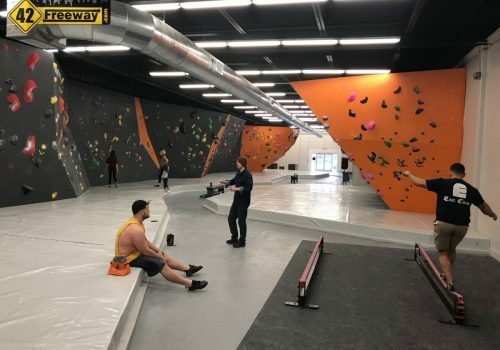 42Freeway spent about an hour in the gym chatting with owner Chris, and also some of the patrons in the facility. 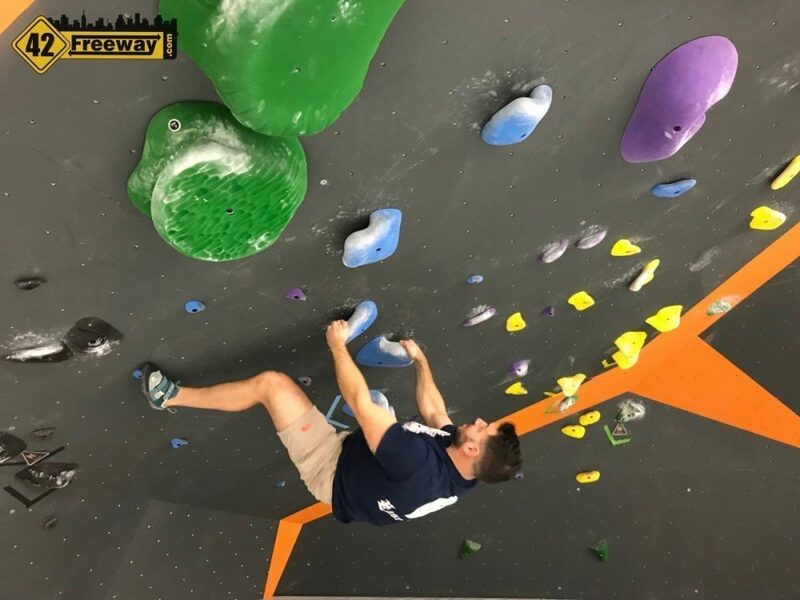 Chris is originally from Franklinville and spent considerable time in Colorado as a minor league baseball player. 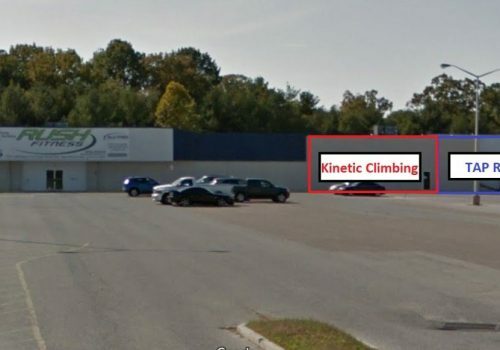 That is where he gained his love for hiking and climbing, which lead him to coming back home and opening Kinetic. 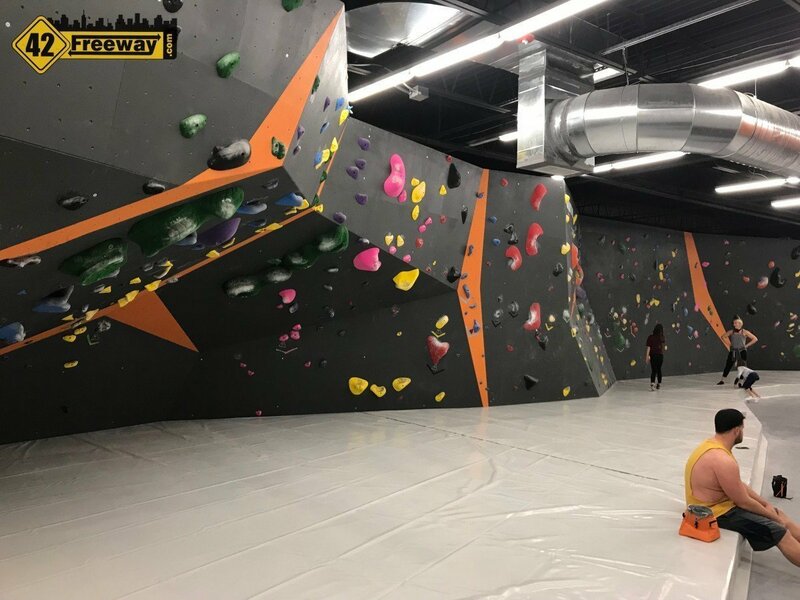 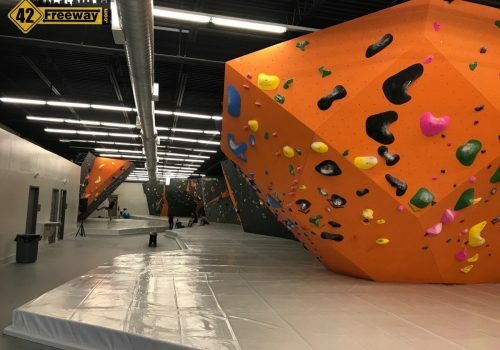 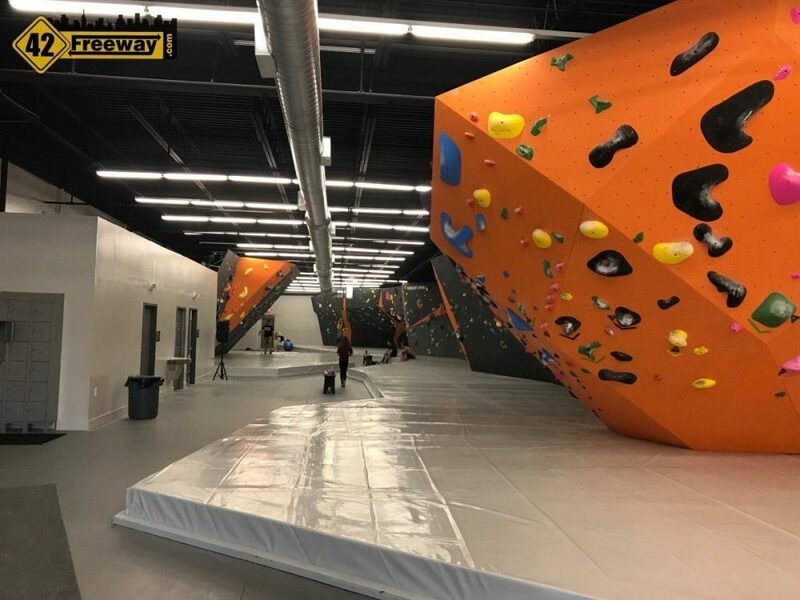 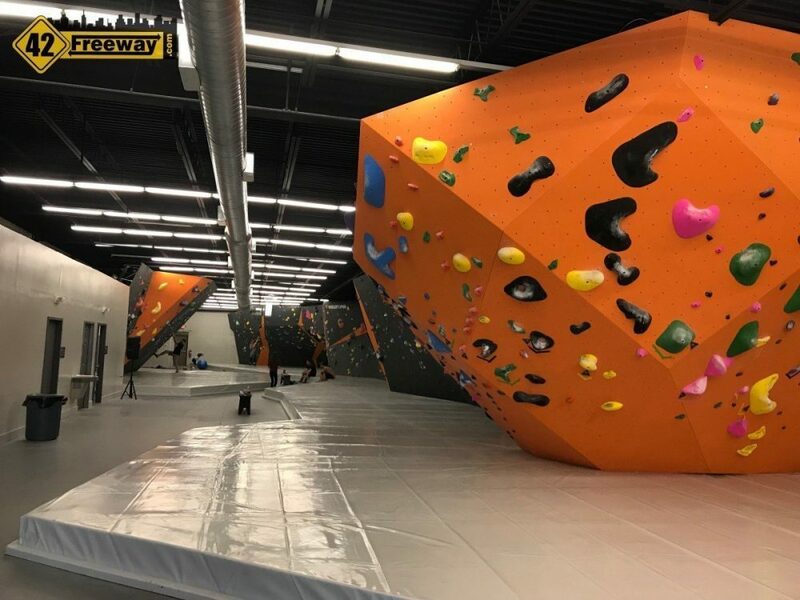 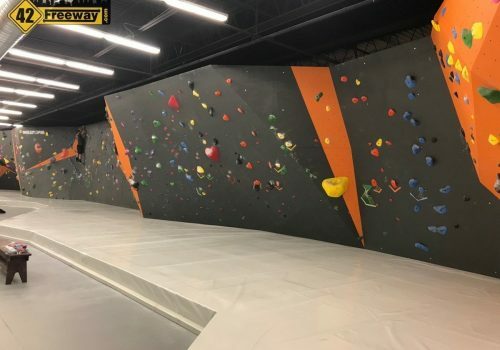 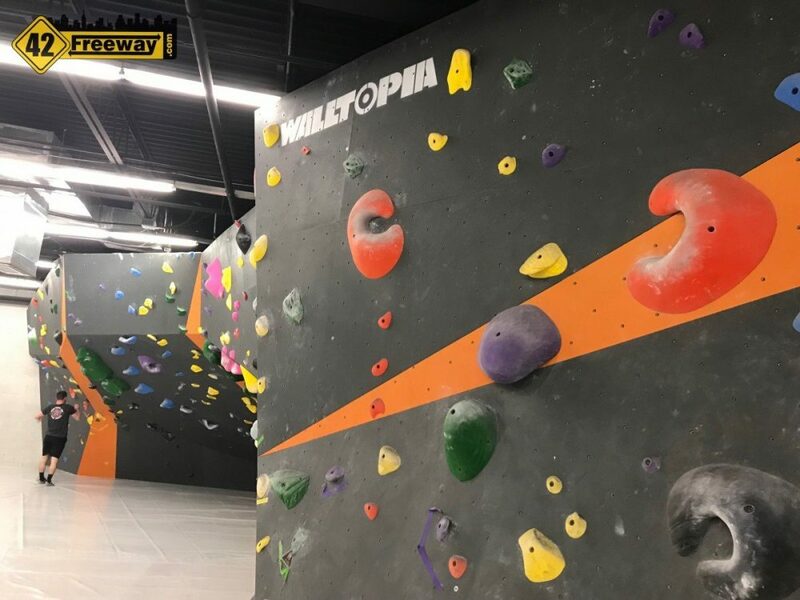 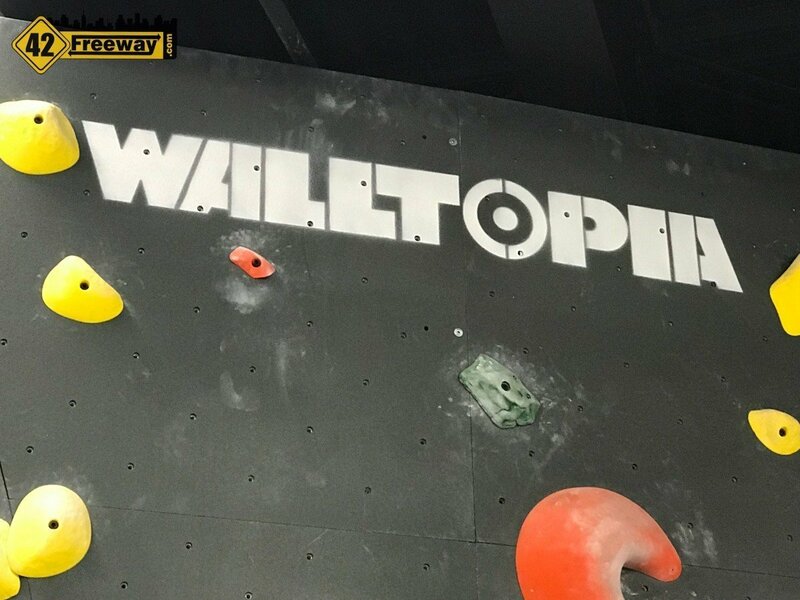 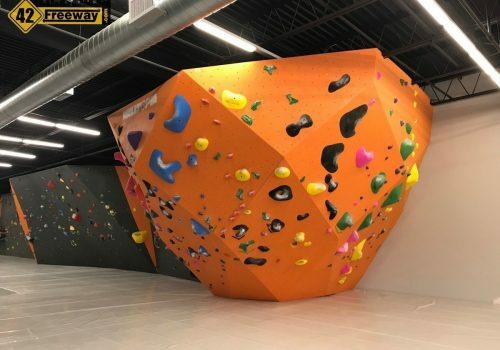 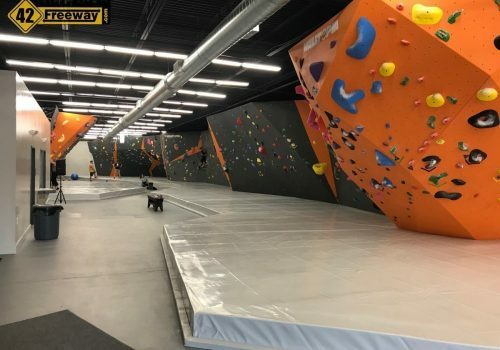 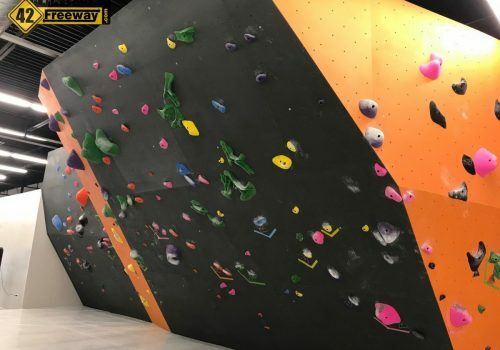 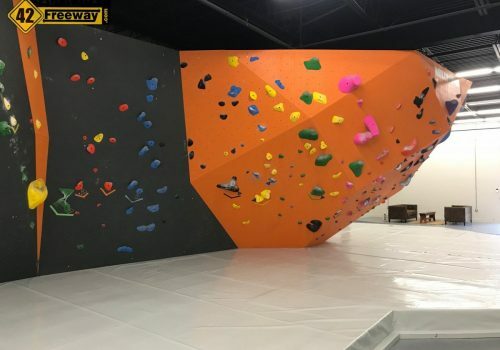 The bouldering walls were designed and built by Walltopia who is the leader in the industry. 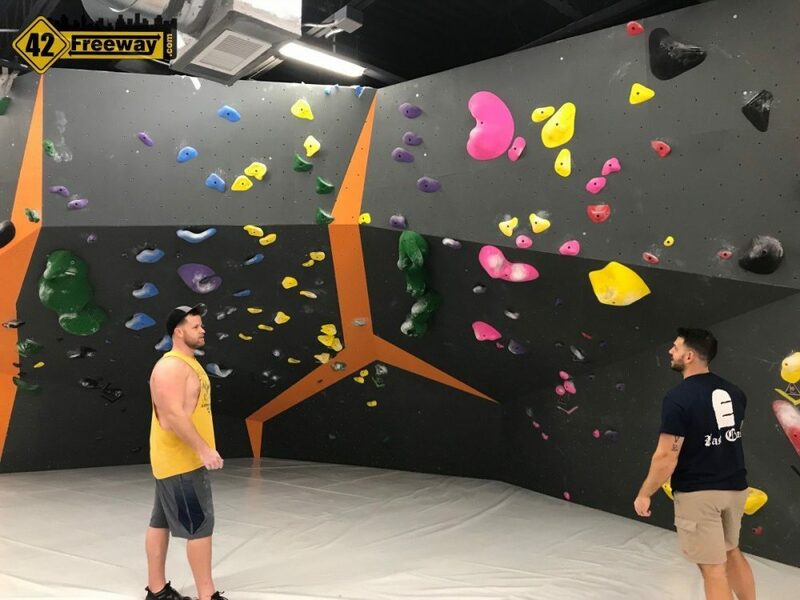 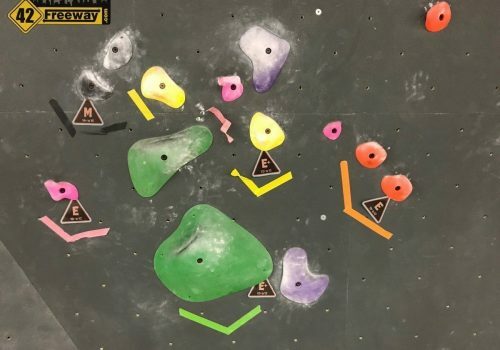 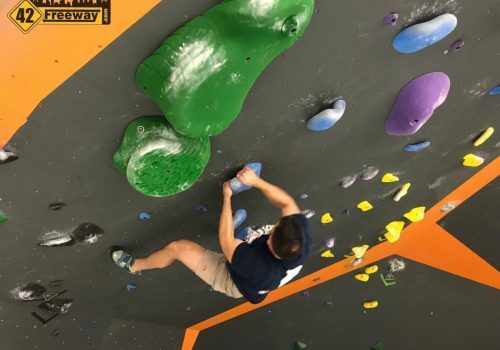 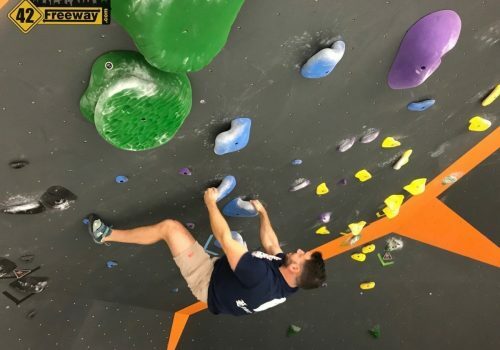 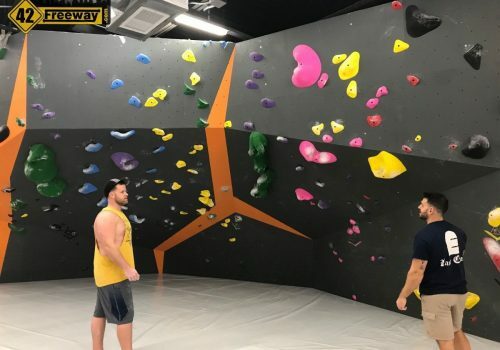 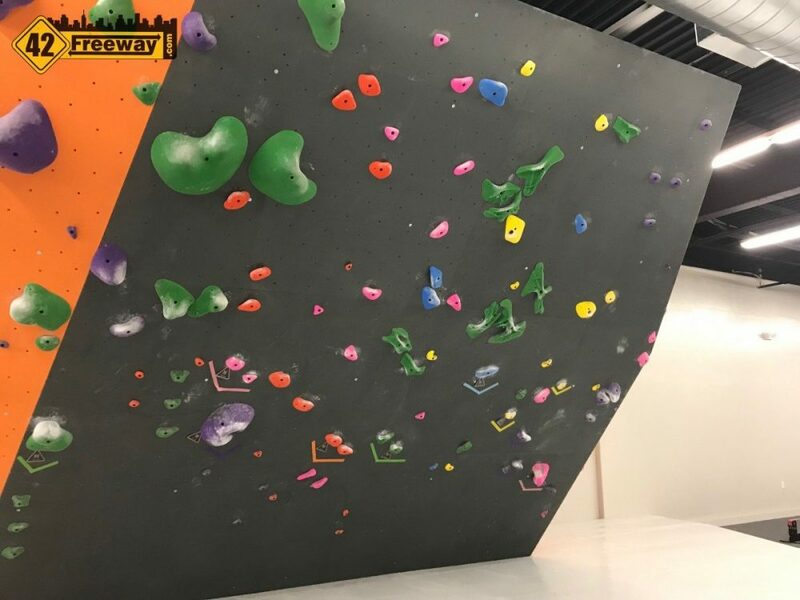 The unique climbing components can be changed over time by Chris and his staff to offer constantly changing new challenges. 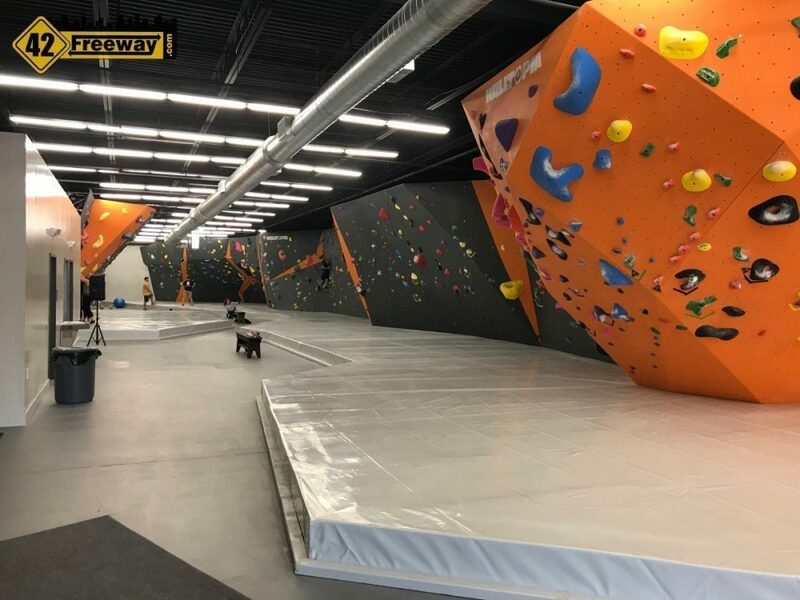 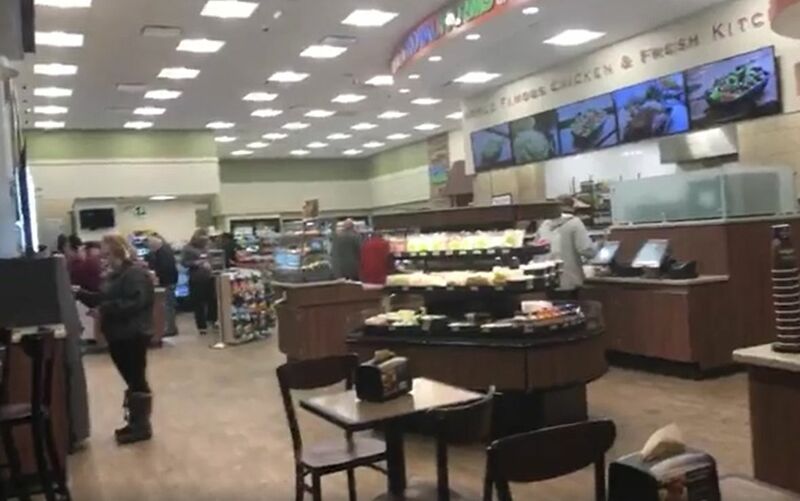 The walls are set up at varying angles vertically and horizontally, and the floor area surrounding the walls are covered with thick protective padding. 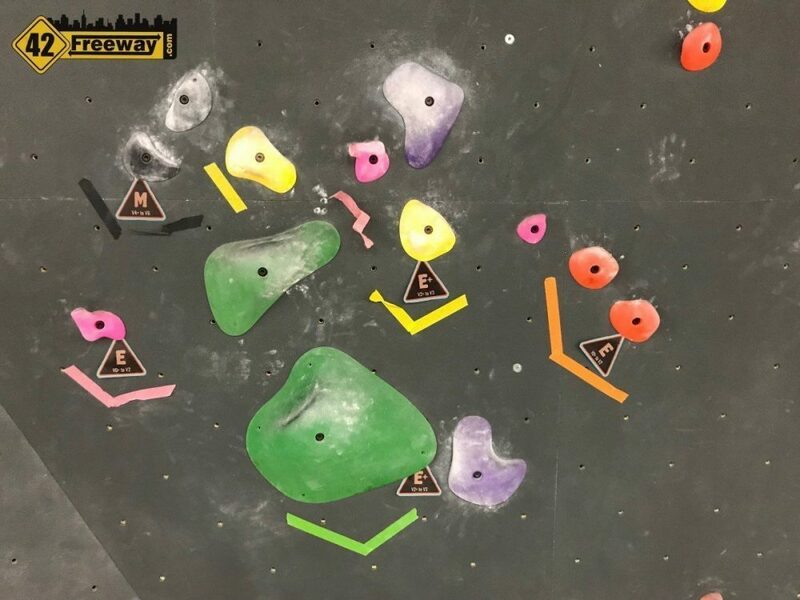 There are a variety of suggested path challenges offering many levels of difficulty, and the color coding helps identify the paths. 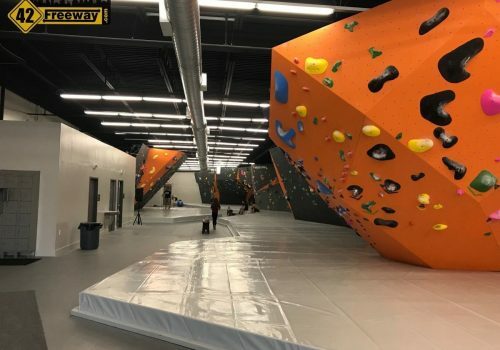 Kinetic also offers a slackline apparatus which offers a tightrope like experience, and they have plans for adding an even large installation.